This fungus was seen in Sandy Dell on Sunday. 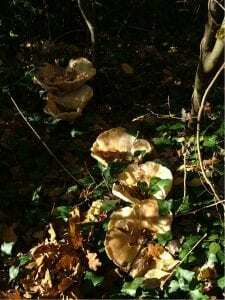 Trooping funnel fungus seen in Sandy Dell 18th November 2018. It appears to be a larger example of the species seen next to the pavement at the Privett Road end in November 2012. Seen near to Privett Road in November 2012. Research indicates it is Infundibulicybe geotropa, also known as the trooping funnel or monk’s head, a funnel-shaped fungus widely found in Europe and (less commonly) in North America. 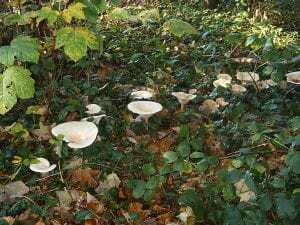 A large sturdy cream or buff-coloured funnel-shaped mushroom, it grows in mixed woodlands, often in troops or fairy rings and the cap may reach 20 cm (8 in) in diameter. The largest known fairy ring in Belfort, eastern France, has been reported at over half a mile in diameter and estimated at 800 years of age. Purbrook and Widley Area Residents' Association Environment Group's website is hosted by, but not compiled by TCV. The information contained on this website is for general information purposes only, supplied by Purbrook and Widley Area Residents' Association Environment Group. The views provided by Purbrook and Widley Area Residents' Association Environment Group are not representative of TCV. TCV is not liable for any loss or damage including, indirect or significant loss or damage, or any loss or damage whatsoever arising from loss of data or in connection with, the use of Purbrook and Widley Area Residents' Association Environment Group's website. We do not endorse, control or approve the content on Purbrook and Widley Area Residents' Association Environment Group's website.